Bouncy Bug is an action game that features flexible liquid environments, and awesome trampoline style action like nothing you have played before. Press the jello walls to bounce Clyde around the levels while trying to collect all the fruit. Press the floor and walls to bounce our hero into every twisty, bouncy corner. Swipe the jelly to create waves in the jello. Carefully time your bounces to get more height and speed with each bounce. *Unique control method – touch walls to bounce. All in all I thought it was a pretty decent time waster game. You know, if the system goes down at the office, you can easily pass time while IT eats lunch instead of working on your computer. It was a little addicting. I used 2 battery charges in a night and my wife did as well. Very simple, but entertaining game! 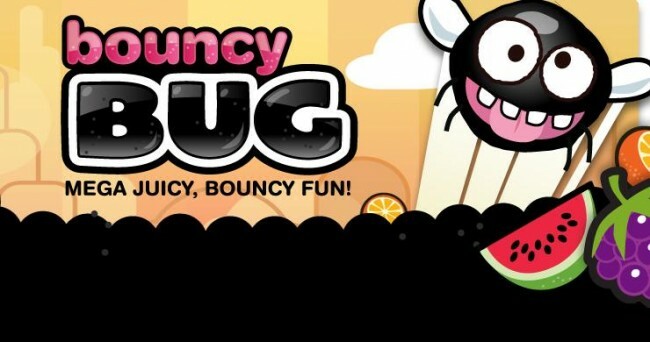 Be sure to follow Bouncy Bug on twitter @BouncyBugGame as well as @appinthebox as well as @_The_Chatterbox. For $.99, this one gets my approval. Special thanks to Appinthebox.com.au for sending over the download. Want YOUR product featured on the Chatterbox Blog?!? Send all inquiries to brad.mcquillen@yahoo.com. Posted on September 11, 2011, in Uncategorized. Bookmark the permalink. Leave a comment.